On Friday of last week, VCE filed comments on the US Forest Service’s evaluation of the new, larger turbine design that Iberdrola is proposing for their Deerfield Wind project. “It is frustrating, but not surprising, that the Forest Service has once again failed to look critically or accurately at the project impacts,” VCE Executive Director Annette Smith said. The Supplemental Investigation Report, or SIR, was needed after Iberdrola proposed using taller turbines with longer blades. According to the SIR, in the proposed new design the blades of some of the turbines would be 11.5 feet longer than before, and others 16.4 feet longer. Some of the tower heights would increase 10 feet, and others 26 feet, rising up to 415 feet. VCE’s comments on the SIR focused on a number of issues, including: 1) conflicts of interest by Forest Service contactors who also work for the wind developer of the proposed Deerfield Wind project; 2) a lack of analysis of visual and noise impacts to the Aiken Wilderness, which is located less than two miles from the project site; 3) overstated climate change benefits from the project; and, 4) noise impacts on project neighbors, wildlife, and the Aiken wilderness. “Looking at the videos and audios of project neighbors that we have linked to in the filing, you can see what the real world impacts are to people who are forced to live near these industrial wind projects. These impacts are serious, and must not and cannot be ignored. Until these wind projects can avoid hurting people this way, they should not be permitted,” Smith stated. 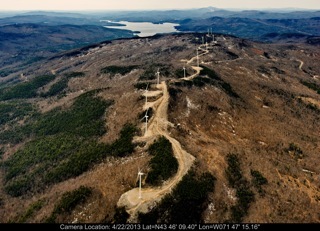 For the Deerfield project, Iberdrola, Inc. is proposing to build 15 400+ foot tall wind turbines on two ridgelines in the Green Mountain National Forest in the towns of Searsburg and Readsboro. The PSB permit was issued in 2010. A federal special use permit has been granted by the Forest Service but is currently under appeal. However, the appeal process has been “stayed” for eight months, at the request of the Forest Service, to allow them to perform the SIR of the revised Iberdrola design. “The Forest Service failed to use the eight months granted by the stay to collect any new information or respond to the many weaknesses of their previous analysis that VCE and others have highlighted. The SIR uses old data from 2007 and 2008 – there is plenty of new science from the last four years that could have and should have been utilized,” Smith said.